Need your lot size and price? Oasis Property Maintenance is an established, professional lawn care and maintenance company serving Northwest Arkansas for over 10 years. We specialize in residential and commercial lawn mowing services that include weekly or bi-weekly lawn mowing, edging, line trimming, and blowing clean all hard surfaces. Our seasonal services include spring scalping of Bermuda and Zoysia lawns and leaf removal services. Our service area includes the incorporated city limits of Rogers, Bentonville, Centerton, Cave Springs, Lowell and Springdale. We limit the scope of the services we offer and the areas we service so we can provide you with the best possible lawn care services at an affordable price! With over 10 years of experience providing lawn care services in NWA, you can be assured that we have the experience necessary to properly take care of your lawn care needs without problems or hassles. All of our work is done by our team of lawn care professionals and none of our work is ever outsourced. We use professional commercial quality lawn equipment when caring for your property to deliver the best results. Our office staff uses the industry leading scheduling and billing software to ensure your lawn service always receives service on the same day each week and you are billed accurately and in a timely manner. You will also be notified if there are any weather related delays that may affect your service when necessary. Our office staff is available Monday through Friday from 9:00 am to 5:00 pm to address your questions or concerns by phone or email in a timely and courteous manner, without having to make numerous calls or requests. Our hassle-free lawn service is designed to provide you with the lawn services you need, the quality you expect, all at an affordable price. We strive to provide the best lawn mowing service in Northwest Arkansas. If you are in need of lawn maintenance services in NWA, give us a call at (479) 616-1372 today and get a hassle free lawn care service so you can start enjoying your lawn instead of laboring over it. Why Choose Oasis Property Maintenance? We provide services to certain locations on a set day to keep our productivity high and our cost as competitive as possible. For this reason we will assign you a set mow day each week. 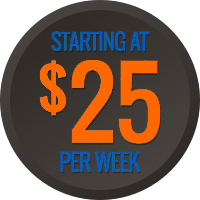 Our weekly lawn mowing services starts at just $25. We determine your price based on the size of your property before improvements and the frequency you want your lawn serviced. Your complete satisfaction is our top priority. Our friendly office staff is available Monday - Friday from 9AM - 5PM to answer any questions you may have. Our team of lawn care professionals have been serving Rogers, Bentonville, Centerton, Lowell, Cave Springs & Springdale for over 10 years with pride and dedication to our customers. Our online customer account management portal allows you to manage your payments easily online. We accept Visa, Mastercard, Discover & American Express. We have a 24 hour Satisfaction Guarantee. If you are not happy for any reason give us a call within 24 hours and we will send someone out to correct the issue. We appreciate the opportunity to make your lawn and landscape a hassle free space for you to enjoy. To update your payment information or view previous service records.